Making its debut for 2012, the Hyundai Veloster Base compact hatchback has a unique asymmetrical body style, with a single long door on the driver's side and two shorter doors on the passenger side, creating a unique coupe/sedan/hatchback body style. 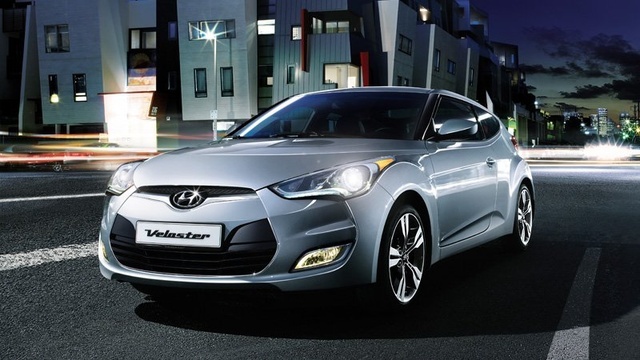 Outside, the Veloster's eye-catching exterior design, with its exaggerated wheel arches and sleek, hunkered-down look, mimics a high-performance sport motorcycle. Other exterior design elements include an aggressive, wide-mouthed front end, a black intake grille, wraparound headlights, a tapering roofline and a gently sloped rear end. Heated side mirrors, LED accents around the headlights, a rear spoiler and 17-inch alloy wheels are among the standard exterior features. Under the hood, power for the front-wheel-drive Veloster Base comes from a new Gamma 1.6-liter 4-cylinder engine, which delivers 138 hp and 123 lb-ft of torque. It mates to 6-speed manual transmission and posts fuel economy numbers of 27 mpg city/37 highway. The engine includes Gasoline Direct Injection (GDI), a first for a powerplant of this size, Hyundai notes, as well as Continuously Variable Valve Timing (D-CVVT), which helps to optimize efficiency. Safety features include 6 airbags, antilock brakes with brake assist and a Vehicle Stability Management system with electronic stability control and traction control. Inside, the 4-passenger Veloster Base comes standard with a number of high-tech features, including a 7-inch touchscreen, which integrates Pandora, Gracenote voice-recognition and Hyundai's Blue Link infotainment system with voice text messaging, web searching, turn-by-turn navigation and vehicle diagnostics. Owners can also use the touchscreen to manage the 6-speaker, 196-watt audio system, which includes a CD/MP3 player and iPod and auxiliary input jacks. Premium cloth upholstery, a 6-way manually adjustable driver's seat and a 60/40-split rear seatback also come standard, along with air conditioning, a tilt/telescopic steering wheel with cruise and audio controls, remote keyless entry and power windows and door locks. Options include a navigation system with a rear-view camera, an upgraded audio system with SiriusXM satellite radio, a leather-wrapped steering wheel and shift knob, upgraded seats with leatherette bolsters and a panoramic sunroof.